Many photographers avoid using their Speedlite flash to improve their pictures as they feel that the results are un-predictable. After a session of training with Brian Worley this misconception about Canon flash is overcome and pictures are improved with effective simple lighting that is always available. Based in the UK and covering the Thames Valley areas of Buckinghamshire, Berkshire, Oxfordshire and Hertfordshire. Brian Worley is a master of teaching photographers how to make better photos with their Canon Speedlite flash. People are the number one subject for photography, using a Speedlite flash to add light your pictures is one of the best ways to improve the quality and value of your photos. It’s not just for people, product shots and still life pictures all benefit from good lighting. Starting from simple lighting with the humble built-in or pop-up Speedlite on your EOS I can show you how to take better looking pictures with Easy Wireless flash. 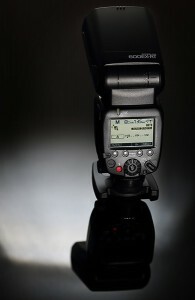 Built-in to the entry-level EOS 600D and EOS 650D cameras, Easy Wireless flash is one simple step. For more advanced portraits using the Canon radio flash system with the Speedlite 600EX-RT and Speedlite Transmitter ST-E3-RT make sure to check out how I use Speedlites in the studio too. In my training I not only share my experience and expertise, you will also learn how great modifiers help to improve the range of lighting styles that you can create for better pictures. I’m a big fan of using CTO gels on my flashes to add warmth to the pictures when working on location in cold weather. All this fits in one light stand bag and one camera bag like the Vanguard Heralder 38. It’s important for any trainer to keep up with the latest products so I provide Speedlite flash training for you regardless of the flash you have. What this means is that I can offer training on Canon radio controlled and pulsed light controlled flash systems. Over the past year I have trained photographers with Speedlite 550EX, 580EX, 580EX II, 600EX-RT, 430EX, 430EX II, Macro Twin Light MT-24EX and third party flashes. I have delivered seminars and workshops across Europe for Canon and individual photographers.